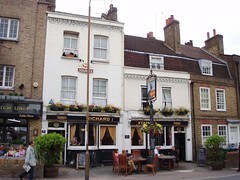 A Young's pub in Greenwich. A cosy locals' pub, known locally as "The Tolly" for reasons explained by the Young's website (it was once owned by the Tollemarche & Cobbold brewery). It still has separate entrances for the saloon and public bars, the latter being larger with two big tables by the window and smaller tables running along the wall opposite the bar, which is between the two rooms. They share the same toilets at the back. Out the back is a decent-sized beer garden area, with plenty of umbrellas and canopies and well-maintained and decorated. There are plenty of tables, including one more than large enough for our party of 10 or so. There is a small BBQ area as well just by the back door. There's also some seating at the front of the pub, set back from the pavement. When Ewan, Kake, Ruudboy, and friends visited in June 2008 there were four ales available on handpump: Young's ordinary (£2.85/pint), Young's Special, Waggledance (also £2.85), and Bombardier. On bob's April 2009 visit the ales were Special (£2.83/pint), Ordinary, and Deuchars IPA. According to the Young's website, food is served noon-3pm and 6pm-9:30pm Monday to Saturday, and noon-9:30pm Sunday; though the blackboard on a Saturday visit in June 2008 gave that day's food times as 10:30am-3pm and 6pm-10pm. The specials on that visit were garlic mushroom jacket potato (£4) and ham, egg & chips (£6). Ewan tried the former; it was perfectly decent for the price, and came with a few leaves of lettuce photo. Side salad, fresh enough, was an extra £1, but came without dressing. Kake tried the burger from the regular menu (£6). It was a decent size, and it came with salad and chips, but the burger itself was not high quality, being made with overprocessed mince. Bizarrely, it was served on a wooden chopping board photo. Sunday roast beef with Yorkshire pudding, roast potatoes, and seasonal potatoes is £7 (from menu, June 2008). Accessibility: No steps at entrances, but steps down to the toilets from both bars. I think there was at least one step to the beer garden. Last visited by bob, 19 April 2009. Opening hours and food times taken from Young's website, February 2008. Last edited 2013-05-10 07:55:36 (version 29; diff). List all versions. Page last edited 2013-05-10 07:55:36 (version 29).